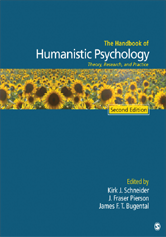 The Second Edition of the cutting edge work, The Handbook of Humanistic Psychology, by Kirk J. Schneider, J. Fraser Pierson and James F. T. Bugental, represents the very latest scholarship in the field of humanistic psychology and psychotherapy. Set against trends inclined toward psychological standardization and medicalization, the handbook offers a rich tapestry of reflection by the leading person-centered scholars of our time. Their range in topics is far-reaching---from the historical, theoretical and methodological, to the spiritual, psychotherapeutic and multicultural.